Amsterdam residents and visitors alike may soon see the city from sweeping new heights. 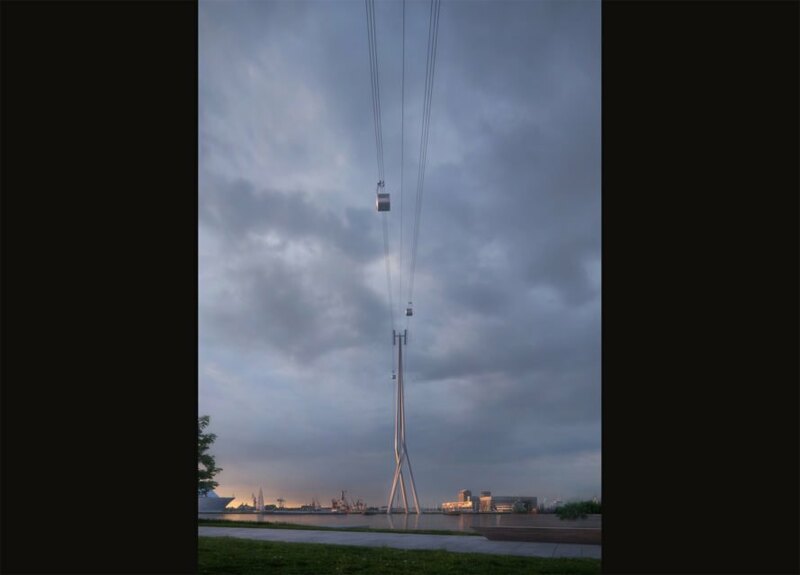 Dutch architectural practice UNStudio has unveiled designs for the IJbaan Cable Car, a “future-proof” public transit system connecting Amsterdam West with Amsterdam Noord / NDSM. The cable car will span a little less than a mile (1 1/2 kilometers) and can be easily expanded in the future if needed. 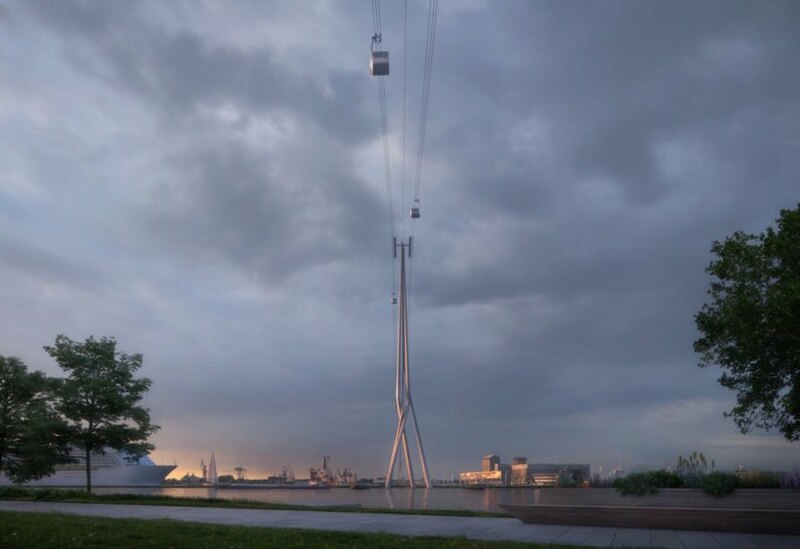 The IJBaan Cable Car was commissioned by the IJbaan Foundation (Stichting IJbaan), a grassroots citizens’ movement initially started in 2015 as a crowdfunding campaign led by Bas Dekker and Willem Wessels. 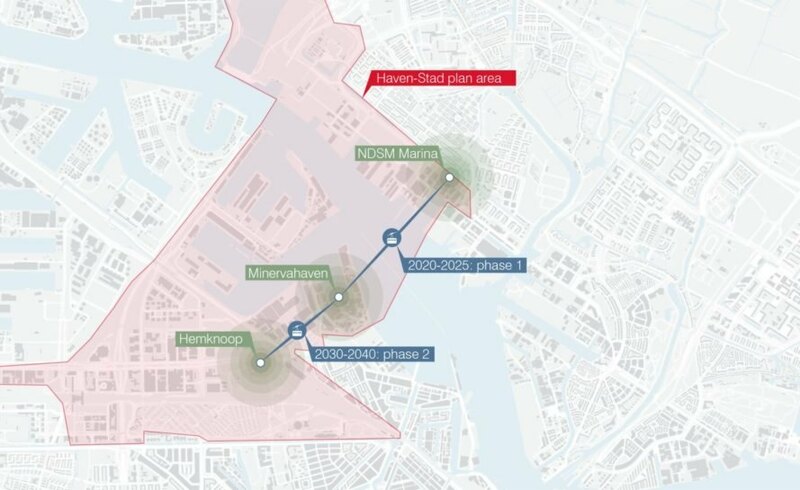 Now supported by the Municipality of Amsterdam, the initiative aims to “create a new connection across the IJ bay by the 750th anniversary of Amsterdam in 2025.” The all-electric public transport system will create transport hubs and destinations. Designed as a new architectural icon, the cable car system consists of two stations—NDSM Marina on the North and Minervahaven to the South—and three supporting pylons with varying heights. Inspired by the city’s industrial past, the slender and sculptural towers will not be visible from Amsterdam’s famed canal ring so as to abide by UNESCO World Heritage height limitations. The system will take 4.6 minutes to complete a full journey at an average speed of 13.42 miles per hour. The passenger cabins can accommodate 32 to 37 passengers, while bicycle cabins can hold four to six bicycles. The cable car system consists of two stations—NDSM Marina on the North and Minervahaven to the South. The slender and sculptural towers vary in height. The pylon designs are inspired by the city’s industrial past. It will take 4.6 minutes to complete a full journey at an average speed of 13.42 miles per hour. An overview of the system. 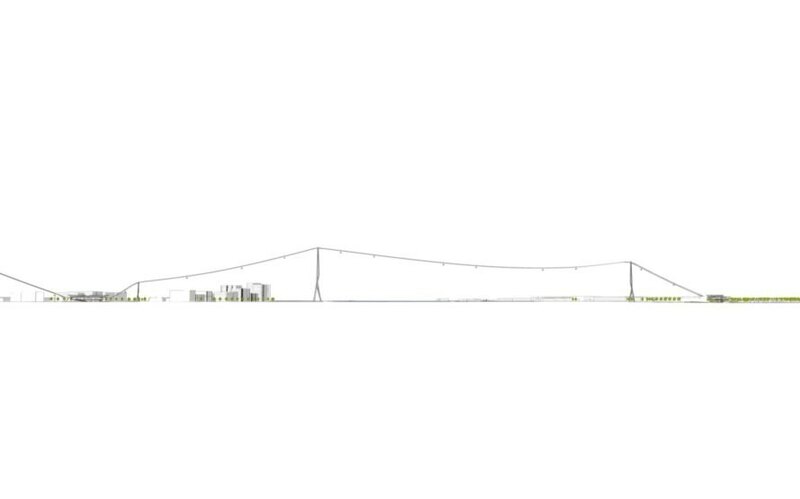 A section view of the proposed cable car.